In Part V, Dominic Toretto becomes Danny Ocean. In this seven-part series, Rob watches the Fast and Furious films for the first time. Check out Part I here, Part II here, Part III here, and Part IV here. "$11 million? Sounds like a whole lot of vaginal activity to me." In purely critical, analytical, and ontological terms, Fast Five is flat-out crazy cuckoo banana pants. It's loud, ambitious, visceral, and delightfully unrefined. It builds on the example of Fast and Furious (as I hoped it would) and completes the series' transition from the race world into globetrotting action/adventure. It's not nearly as measured or well-composed as its predecessor, but it doesn't need to be. This is no time to play it safe. This is the time to throw everything at the wall and see what sticks. And I do mean everything: Fast Five brings back all of your favorite characters for an Ocean's Eleven heist adventure drunk on Corona and fueled by nitrous oxide. Oh, and they threw in The goddamn Rock for good measure. So let's get into this business: After freeing Dom from federal prison at the end of Fast and Furious, Brian and Mia head to Rio to lay low. Eventually, the three are reunited and framed for the murder of DEA agents while unknowingly pulling a job for South American Crime Lord Villain Guy. Hoping to clear their names and punish said Crime Lord Villain Guy for his indiscretion, they put together a team of Fast veterans to pull off the ultimate heist. Meanwhile, The Rock plays Belligerent Badass Tommy Lee Jones Special Agent In Charge Guy, who is willing to do whatever it takes to bring Toretto to justice. He tracks the group as they prep and plan to steal $100 million in one final job before retiring. And then things get completely bonkers. There was a meeting at some point, in some board room at Universal Studios, in which the idea of adding The Rock to the Fast family was proposed. Maybe an ambitious marketing executive realized that both the Fast series and The Rock appealed to similar demographics. Maybe a quid pro quo was struck between the two parties which would give The Rock special studio perks or development rights to a passion project. Maybe they just wanted another bald guy and threw a dart at a bunch of headshots. Whatever the case, this decision should be remembered as one of the most inspired in all of cinema history. The Rock is impossibly, immeasurably fun in this ridiculous role, and getting to see him bark nonsense orders at lackeys and growl at Vin Diesel like a pit bull is more than worth the price of admission. My major criticism of this film is that he just isn't in it enough. Fast Five is able to pull off a clean transition into the heist genre because of its colorful wealth of supporting characters. Each one is easily re-appropriated into a new role: Dom is the chessmaster, Brian is his conscience, Han* is the clever stealth guy, Tej is the tech/science guy, Gisele is the seductress, Roman (!) is the fast-talking misdirector, etc. While their plan makes absolutely no sense and Hobbes' interruptions negate most of their preparation anyway, we still get those great montages of tinkering trial-and-error that flesh out the characters and put us firmly in the bad guys' corner. Each team member gets a moment to shine. Again, the logic at play here is mostly illogical, but by the time Dom and Brian are dragging a 20x20-foot safe through the streets of Rio at sixty miles per hour and using it as a flail against oncoming police cars, you won't give a damn anyway. It's pretty fun. That being said, there are legitimate points of concern. 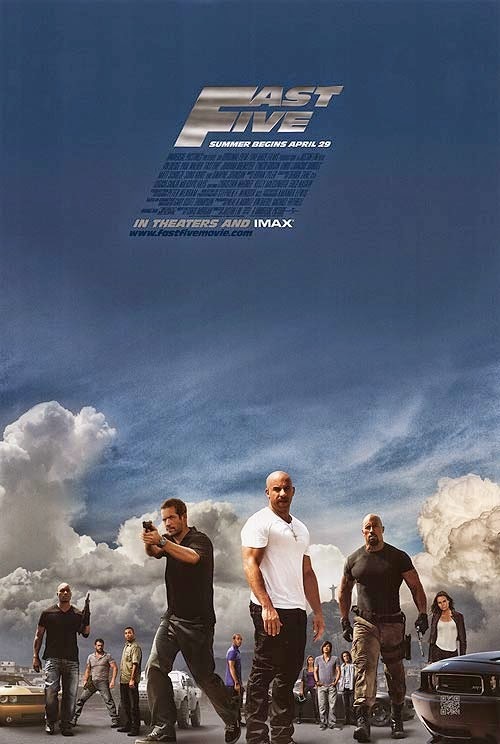 Fast Five gets away from itself in places and needs about twenty-five minutes trimmed off. Anything involving Vince (including the opening action sequence), the first confrontation between Dom and Hobbes, and a few other smaller scenes should have been cut or condensed to keep things focused and reduce the bloated running time. It takes entirely too long to get the team together, and that whole forty minutes spent on the microchip in the car could have been rewritten into a few lines of dialogue. Dom actually has a nice arc involving his love of family (a theme used briefly in the first film but mostly forgotten until now) that is cut short in favor of a random street race between the four leads. It feels like a waste. It's alright, though. This is what I meant when I said the film was wildly ambitious. They're trying a lot of different things, and not all of them are going to work. I applaud the effort. Looks like we're coming down to it now. With (presumably) only two films left in the series, it's time to introduce the big villains and set the stage for the main event. All the pieces are in place and we've got lots of disposable income to work with. I'd like to see Dom and Brian develop a relationship outside of begrudging, grunting respect. It's been five films and I'm still not sure what they think of each other. I'd like to see Mia, Gisele, and Letty find real roles in the group (these films have crazy gender issues that I've tried to ignore given the genre), and I'd like to see things get truly insane. Fighter jets powered by Nos, maybe? *I've decided that Han is my favorite character. I have no idea why. He comes from my least-favorite film in the series and barely says a word or does anything of note, but he just rules so hard. He gets to smirk and eat potato chips while everyone else works and Gal Gadot throws herself at him. Boss.